Standing in front of the strips of paper I read the directions again: write the names of the saints in your life. The names of the saints that have died and gone before us on the white paper. Use the strips of colored paper to write the names of the saints in your life that are still with us. I began writing. I wanted it to be something I did quickly before the next thing on my growing “to-do” list that day. I could not. Here in the space between Chapel and the refectory, and on my hurried way to the library, this request moved me outside of the carefully accounted for and scheduled moments of my day. I lost track of the slips. Name after name. Moment after moment. I put down the marker, and held time still with my breath as I remembered standing in deafening silence surrounded by life and yet alone with death — unable to move out of the between and back into time. I am standing in front of her fresh grave. We buried her exactly a week after I birthed her still body. In all respects it was a glorious sunny mild November day. I was told later that an eagle flew overhead right as the silence fell. The silence that deepened my numbness. The moments I had not been able to imagine had come to pass — the awful processional out into the world Emily wouldn’t know. First she was carried by her father in that tiny casket step-by-step down the church aisle, then the drive to the cemetery. We survived watching that tiny pink casket go into the ground next to her great-grandparents. We listened numbly to prayers. In the first second of quiet we put single roses on top of that casket before it was buried in earth. Emily’s older sister, Megan, gave me the gift of being her 4-year-old self when nobody could convince her to give up the rose she was holding. In that moment I wanted to take her and gather her in my arms and twirl her around and around until we were both dizzy. I wanted to be in her moment of joy in the beauty of the rose. Just mere hours ago I had been encouraging the stream of people entering the church to look at her: “she’s so beautiful.” My heart ached to hold onto that beauty like a 4-year-old with her hands on a rose stem. “I can’t do this anymore” I said not realizing my thoughts had broken the silence. “Then don’t,” my mom said as she took my arm and gently guided me across that threshold. I wiped my wet eyes and gulped in deep breaths of fresh air as I made my way from one Wartburg building to the next attempting to return to place and time — 13 years of living later — on my way to the library and the life of to-do lists. A glance at my watch claimed the moments connected in minutes. The next week in chapel names were read, candles were lit, Gospel was spoken, and those slips of paper — white and colored — hung together in sunlit windows and air stirred them as if with the dance of eternal life. ALL SAINTS DAY REMEMBERED by Josh Johnson, final year M.Div. Today is All Saints Day, a day in which we remember and honor the saints of our lives. Saints are far and near, and both living and dead. As part of preparing for today’s message, I reflected upon experiences of this day since coming to Wartburg. My first All Saints day here at the castle was the type of day that I had grown accustomed to. We celebrated those who had gone before us with familiar hymns, the reading of the names of the recently deceased, and the lighting of candles. It was a celebration of all those who had touched us throughout the years. The following year was quite the opposite. As some of you know, my second year here on campus was marked by the death of our son Josiah. Shannon and I found out 2 weeks prior to school starting that his heart had stopped beating. Josiah was stillborn at 37 weeks. All Saints took on a much different meaning for me. I remember yearning to hear his name read with the other saints. This wasn’t the planned path; baby’s names are to be read at baptisms and other celebrations, but this was it for me. Death gave us this one the last milestone. This past All Saints service was also marked with a death in my life. Last summer my grandfather died at 80 years of age. He lived a long, fruitful life and was very special to me. All Saints Day was a day of fond memories as I remembered my special relationship with him. This is how I imagined All Saints Day to go, a sad, yet joyous commemoration. Today’s gospel lesson comes from Jesus’ familiar teaching from the Sermon on the Mount, the Beatitudes. I don’t know about you, but there’s something about these blessings that doesn’t settle with me. Blessed are the poor in spirit, the mourning, the meek, the hungry, and so on. How are the people who experience these blessed? There’s no way Jesus is telling us that some of the most challenging and miserable situations in life are blessings. It has to be a problem in translation. How about, favored are the poor in spirit… no that’s not it. Oh, fortunate are those who mourn… that’s not any better, fortunate is the last word that comes to mind when I think about the death of a loved one. So, if blessed is the right word here, what is Jesus trying to tell his disciples? The next question that begs to be asked from the text, is about the “wills” in the second half of the statement. They will be comforted; they will inherit the earth; they will be filled; and so on. So, when will this take place? When will those who mourn be comforted? Death is an unavoidable reality of our world. Death sneaks in and takes away a loved one out of nowhere; death also comes for those for whom we expect it to come. Nevertheless, death separates us from those we love. It stings. It hurts. It’s unfair. You know this. I know this. When Josiah died and every hope and dream was dashed away in an instant, I was beyond crushed. I had nothing. Sisters and brothers, I am here today to tell you that Jesus’ words are true. No, it’s not because Shannon and I were the “lucky” recipients of “a new angel baby watching over us in heaven.” Moreover, it’s definitely not because we were young enough to try to have more children. I love Noah beyond measure, but he is not God’s comforting answer. God’s comfort came to us by other means. God’s comfort came to us through two friends that showed up at a moment’s notice when we found out this dreadful news. God’s comfort came to us through a supportive community that was present in our time of need. God’s comfort came through the ones who finally treated us as a human beings rather than as a pity case. God’s comfort continues to come through supportive friends who continues to be there. In our time of desperation, we were blessed by the loving presence of those that God sent to comfort us. In our deep grief, in our most vulnerable state, we were blessed because all we had was God, and God was there. The hurt and pain did not go away, and its memory still resides. Nevertheless, it is not to be borne alone. We bear it in one another and we bear it in the one who experienced great agony on the cross. This is the promise of our text today. No matter how crappy life feels, and no matter how far life beats you down. God promises stand the test of time. Christ is there when you are stripped of everything else. The Spirit surrounds you with a witness of saints. PRAYERS OF INTERCESSION By Allie Hjerpe, first year M.Div. 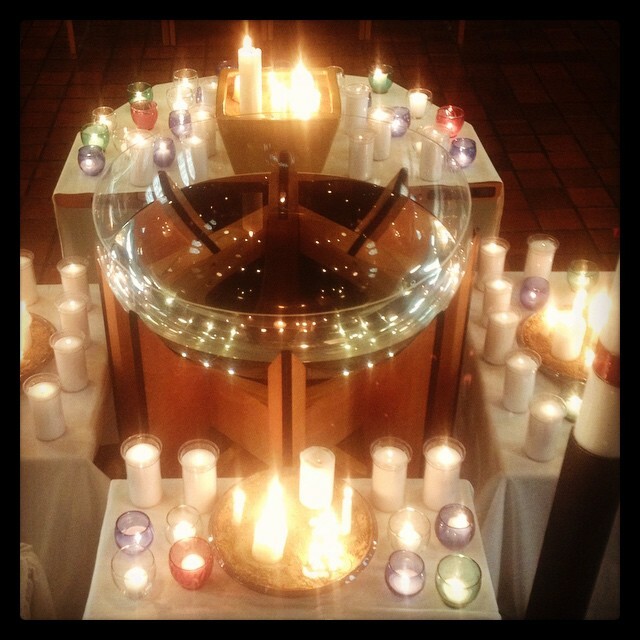 Candles lit surrounding the baptismal font by the community in remembrance during the service. Prayers of Intercession given in Wartburg Chapel worship November 3, 2014 during All Saints Week. For those who are poor in spirit, those searching and yearning for the redemption of Immanuel, God with Us, that theirs is the Kingdom of God. For those who mourn, those wounded reeling from anxiety, anger and grief, that they will be comforted in Christ walking with them and bearing their pain. For those who are gentle, those caretakers and nurturers of our vulnerable resources, that they may bestow their loving protection on our earthly inheritance. For those who hunger and thirst for righteousness, those aching to live according to God’s will, that they may be filled with an abundance of God’s satiating grace and love. For those who are merciful, those practicing compassion and forgiveness in the most challenging times, that they will experience God’s merciful presence. For those who are pure in heart, those open and curious in their faith maturation, that they may ask enough questions to grow, but trust God in the challenge of their journey for sight. For those who are the peacemakers, the advocates for peace and justice in the nations of the world, that they may be filled with authority and passion, and be known by their actions as children of God. For those who are persecuted because of righteousness, those who are oppressed, rejected and injured in Christ’s name, that theirs is God’s peace and the kingdom of heaven. Into your mercy we commend ourselves, and for peace we pray, that all your creation may give you praise and worship, through your Son, Jesus Christ our Lord. Amen.